The Jewish Quarter Walking Tour in Prague traces the history of what was once the largest Jewish ghetto in Europe. As the tour is of a sensitive nature, we only run it in small groups. This moving story is led by an expert guide who specialises in the Jewish Quarter, to ensure participants gain a proper understanding of the subject. The tour embraces the history, traditions and legends of the Jewish people in Prague, from their early settlements in the 10th century, through their enforced isolation, the poverty of the pogrom refugees, and the horrors of the 20th century. Importantly, we find out about the every day life of the Jewish people through the ages: how they lived, worked and survived in the Jewish Quarter, of their successes and of their failures. Admission to, and a guided tour of all the monuments forming the Jewish Museum in Prague is included in the trip. Our guide is certified to guide in the Jewish Museum. The story vividly unfolds as we explore the synagogues, the cemetery and the streets of the former Jewish ghetto. Why for instance, were people buried ten deep, one on top of the other? Who was the famous “Golem”? And how, despite the terrible purges of the Nazi occupation, did the beautiful monuments in the Jewish Quarter survive? 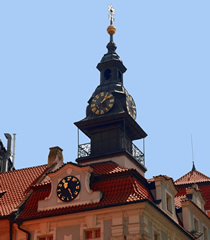 The Jewish Quarter forms an integral part of the history of Prague. With so much of that history contained within the monuments of the Jewish Museum, a walking tour led by a professional guide is the only way to gain an understanding of its significance. It's a fascinating story, if you let us tell it. As we tour the Jewish Quarter, we'll also discover a little of the life Franz Kafka, the famous author born and raised here. -Jewish communities in Prague from the earliest records of 965, right through Medieval times and on to the present day. - Development of the Jewish Ghetto and history of the synagogues, the Ceremonial Hall and the Old Jewish Cemetery. - Background to, and reasons for the redevelopment of the Jewish Ghetto at the turn of the 20th century. - Changing status of Jews over the centuries and the tragedy of the Holocaust. - Remnants of a community; Prague's Jewish people today. - Central Europe's largest collection of Jewish ceremonial art (Judaica), including silver, glass, textiles, manuscripts and other rare and precious objects. Prague Experience walking tours are in English and are led by professional, licensed tourist guides. Note: The Old-New Synagogue is the only significant building in the Jewish Quarter not included in this tour; it is not part of the Jewish Museum, so requires a separate ticket (adults 200 CZK/students 140 CZK). It is not essential to enter the Old-New Synagogue, as during the tour the guide will take you outside it and explain its significance. But if you wish to enter, tell the guide on the day and they will arrange the ticket and include it in the tour. Note: During World War II, a great many Jews were deported from the Jewish Quarter to Terezin (Theresienstadt), a concentration camp and Jewish ghetto. To follow their journey you may wish to also book the Terezin Tour from Prague, which is led by the same expert guides as this tour. Note: On 01 June 2019 the Spanish Synagogue will close for renovation, therefore the tour will spend longer visiting the other monuments. -a tour in another language (supplement applies for some languages). Guided tour of the Jewish Quarter + Admission to all the monuments in the Jewish Museum in Prague: Maisel, Spanish*, Pinkas & Klausen synagogues + Jewish Ceremonial Hall + Old Jewish Cemetery + Robert Guttmann Gallery. *Spanish Synagogue closes on 01 June 2019 for renovation.